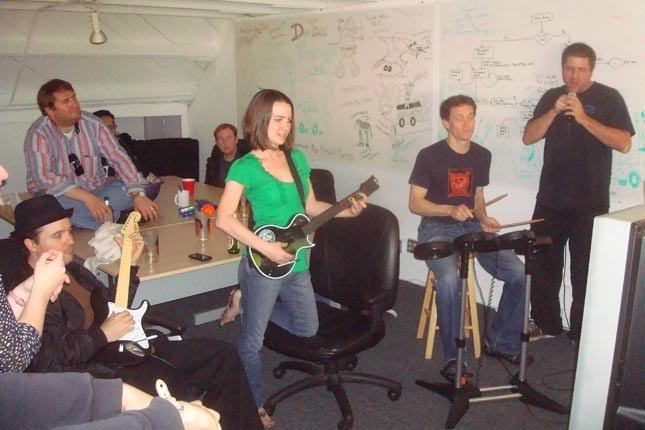 Once a game gets rolling at JibJab people come out of the woodwork to rock their FACES OFF. On Friday we enjoyed a jam before the weekend set in, behold our glorious ROCK. This entry was written by paulhanges and posted on April 13, 2009 at 6:22 pm and filed under Inside JibJab, Talent, Team JibJab. Bookmark the permalink. Follow any comments here with the RSS feed for this post. Post a comment or leave a trackback: Trackback URL. keep on rockin JibJab, you people are the bomb..
Love Jib Jab – Never had so much fun on the Net. Need more Video’s staring you. This is keeping my friends intrest. Everyone talking about the next e-mail they are going to get. Wish I worked there. You guys sure to ROCK!!!! !